Why have While She Sleeps starting jamming Daft Punk?! It feels like a lifetime that we’ve been talking about While She Sleeps as the future of British metal. And yet, it seems that despite their bulletproof recorded output, the Sheffield quintet have never quite hit the heady heights they were capable of. Then last year’s excellent You Are We album catapulted them firmly back to the higher echelons of our scene, kickstarting a cycle that was topped with a ferocious show supporting the mighty Architects at Alexandra Palace back in February. Now, they need to build on their returning momentum. We caught up with guitarist Sean Long about new music, continuing down the DIY path and being influenced by punk rock, the 90s and, erm, Daft Punk. How does it feel to be in the studio again? Many of your contemporaries never got as far as making their fourth album. Your last album, You Are We, was made, essentially, as a completely DIY project, to the point where you even built your own studio. What has that experience taught you going into this record? 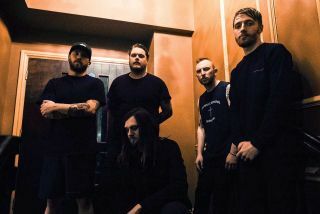 Each While She Sleeps album seems to have its own flavour, so what can we expect this time? Is this still a metal album we’re talking about? And, after the success of the last album, can While She Sleeps still get to the top of the UK metal pile? The new While She Sleeps album is expected early next year.